Repsol Honda rider Marc Marquez was clearly unfazed by his disaster round at Mugello two weeks ago as he was back on the box at the Catalan GP last weekend, securing his fifth podium of the season . After qualifying on the second row of the grid in Saturday’s qualifying, the rookie got off to a lightening start in Sunday’s race and found himself in 3rd position come the first corner behind his team mate Pedrosa and holeshot man (for a change) Jorge Lorenzo. 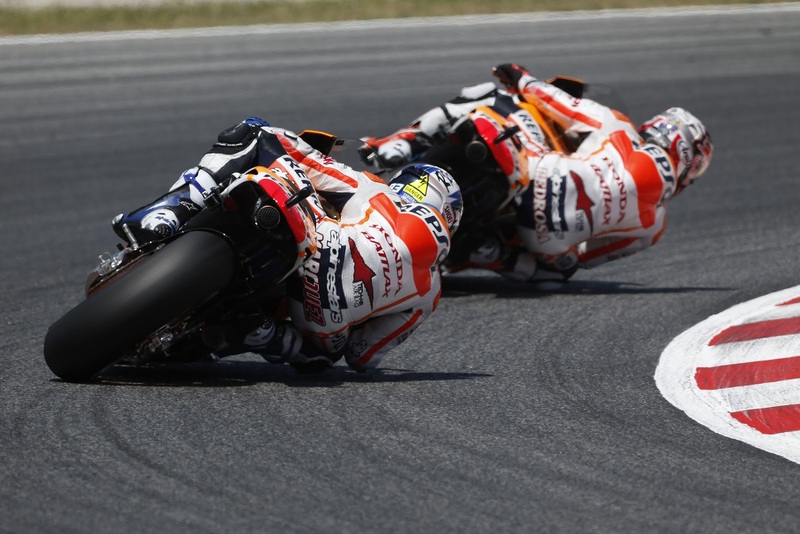 The trio paraded round the circuit for 23 of the 25 lap Grand Prix before Lorenzo increased the pace on worn tyres and an lighter fuel load, too much for the Hondas of Marquez and Pedrosa to keep up with. In a bid for second position honours, the rookie showed his hand several times before a big lunge into turn four on the penultimate lap almost saw an end to his race as he locked the front. Fortunately for Marquez, he kept it rubber side down and had the final podium spot in his grasp but was unable to further challenge his elder team mate for Honda top dog status.